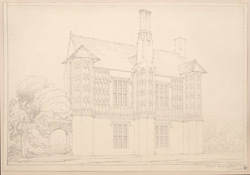 This detailed pencil drawing is of the manor house at Great Cressingham in Norfolk. Although the site is named "Priory Farm" there is no evidence that a religious building stood here. The building is an exquisite fragment of a larger brick house, built by John Jenney between 1542 and 1545. The two storey facade is dominated by three polygonal towers, which are covered with ornate terracotta panels. Each of these panels has a repeating emblem of a hand holding a hawk and wreath, together with the monogram of John and Elizabeth Jenney (not seen in the drawing).